We were walking along the Tai Po River ( 大埔河 ) one chilly November night in 2002, we were looking for people to talk to. We were looking for connection. There she was. Sobbing loudly. She was sitting on a ledge, under the bridge that separates Tai Wo from Tai Po, with her feet hanging over the water. We sat next to her and began talking with her. She want to jump. She said didn’t want to live anymore. She said her life had no meaning. Mike and I stayed with her. We stayed for a long time. She kept crying. We told her life has meaning. That she is important. That she is loved. That if she wants to be loved, she can find it as she gives it. We kept repeating that she is loved. It was dark outside, we were supposed to head back to our apartment for a mandatory phone call that evening. We skipped it. We stayed to tell her that she can have both meaning and truth, if she wants it. We told her that we love her even though we don’t know her. She didn’t jump. We created and found connection. Truth is real. Truth doesn’t change. Truth can be found. Meaning is elusive. It is rarely found when searched for. It rather comes from doing, from being, and from living more than it comes from theory. The best leaders help others define and live by meaning. If you are not in a “position” of leadership, helping others find meaning in their life will help you have the most influence. And if you are, it is your responsibility. We need meaning. People want more meaning. Yet meaning is hard to find. 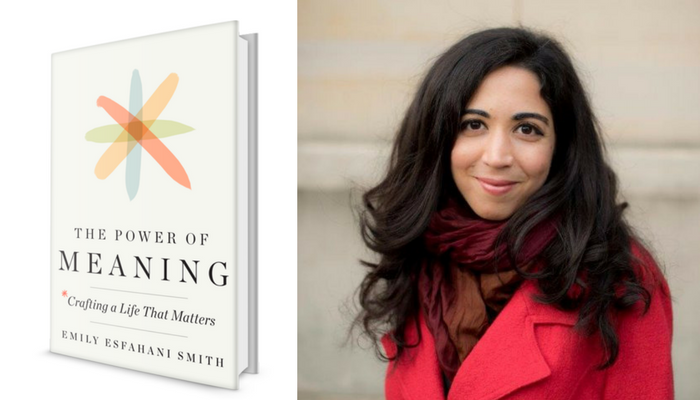 Emily Esfahani Smith has been searching for ways to to find meaning her entire life. She has found some remarkable and actionable ideas. Her new book “The Power of Meaning: Crafting a Life That Matters” is a breakthrough work that teaches with elegantly told stories and wisdom that can only be found after serious pursuit. While I don’t agree with all of her assumptions about religion and truth, she has shared many incredible lessons that when studied and applied can help all of us live more meaningful lives. Belonging – Being part of a group of people that value our contribution is our foundational level for connection. As we have shared interests and common goals, we find ourselves loving and being loved. Interests create a sense of community. Sometimes that interest is familial relationships other times it could be a sports team, work team, professional organization, or even a book. We all need to belong to a group of people who accept and respect us. When you find a group like this, be grateful and present. Find ways to help them as they will no doubt be helping you. Purpose – When the reason why you do something is bigger than the challenges you face, you have found a purpose. Living with purpose does not have be grandiose or world-altering. It just has to be important to you and those you serve. Doing something out of desire rather than compulsion is one cornerstone of living a live with meaning. Storytelling – The stories we tell ourselves become part of our meaning. Everything that happens to us becomes part of story the moment we try and define the impact of that experience. Our identities are created by the stories we believe. We can learn from our own stories or from stories of other people. As we listen to stories, the stories become part of our identity. If the stories focus on redemption, growth, and love, we are destined to have a more meaningful experience. Transcendence – This is where we recognize that there is more out there than us. That we are not only and are lead by a “higher reality”. These moments can happen anywhere or anyplace. The are defined as a time when we rise above the everyday world to realize there is more to connect with. These experiences of transcendence provide us with well-being and peace and help everything else make sense. If we pursue actions that help us develop a sense of belonging, we can craft a life of meaning. If we pursue actions that let us live our purpose by helping others, we can craft of life of meaning. As we tell ourselves stories that match our desired outcome, we can craft a life of meaning. If we pursue actions that provide us with experiences of transcendence, we can craft a life of meaning. While at the Tai Po River that November night, I learned about meaning. I learned that belonging and purpose help us craft our story. As we believe the story of love, importance, belonging, and purpose we can understand how valuable we really are, which in turn helps us to have transcendent experiences. As we live our lives full of meaning, we can help others do the same. We can be better leaders. A good place to start is by reading Emily Esfahani Smith’s new book.